According to the UN report "Energy Sector and Sustainable Development," http://www.undp.ru/documents/NHDR_2009_English.pdf, Russia's GDP energy intensity decreased more rapidly than in many countries around the world, by nearly 5 % per year. Despite this, there is no reason for celebration. In fact, Russia just went up in the GDP energy intensity rating from the 141th to 133rd place of 150. Actual energy intensity of gross domestic product in Russia remains at the level of 2.5 times above the average. It is interesting to note that a century ago, during the times of the tsar, the energy efficiency of the country was 4.4 higher than in the UK and the U.S., and 3.5 times higher than the world average. Experts confirm the thesis of the country's leaders that the prospects for Russia's energy efficiency can be very impressive. However, they argue that high energy consumption is not the consequence of cold climate or the legacy of the planned economy, as it is commonly believed, but the result of extremely inefficient economic regulators. Energy-hungry policy is the display of activities of the Federal Service for tariffs at the federal level, and of Regional Energy Commissions at the regional level. These institutions, together with organizers of separate wholesale electricity market, ignore the technology of co-production of electric and thermal energy. The paradox of the Russian energy sector is that the region, which substantiated the growth of tariffs and applied implicit cross-subsidies instead of punishment, receives encouragement. According to A.Bogdanov, the chief specialist of the Department for energy saving at "Siberia IDC", the goal of reducing energy consumption in the country is implemented by local efforts to reduce the power consumption of each separate region. Each of the regions in the country receives each year allocations from the local budget. If they exceed 70 million rubles, the region can count on additional state funding. Money shall be used to reduce energy costs: installation of meters, energy audits, reconstruction and control of energy resources. 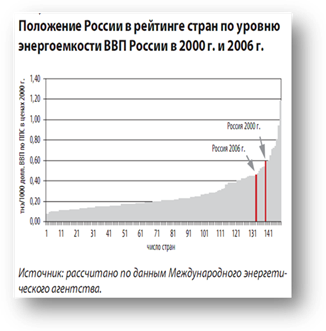 The Instruction of the Government of the Russian Federation reads that energy expenses shall be reduced by 40 % by 2020. However, some experts doubt that these budget expenditures will bring Russia to the specified target. For example, St.Petersburg will spend 210.5 billion rubles during 10 years of the energy efficiency program. This money equals to the total cost of electricity consumed by the city during two years. The expert sees the lack of sound pricing principles as one of the fundamental reasons that gave rise to the system of hidden (technological) and explicit (social) cross-subsidies in the energy sector. When the society cannot fully move to market economy, hidden subsidies for fuel shall be translated into clear, controlled, targeted subsidies. This problem must be addressed by public policy decisions, but not by traditionally hidden technological and political subsidies. At the regional level, experts consider it appropriate to determine the most optimal tariffs, to calculate schedules of loads by comparing profits for manufacturers and costs for consumers, for example, as it is done in the U.S., where electricity tariffs in many states vary by season and by time of the day. France gives another example. There are dozens of tariff system types, divided into 4-5 zones of consumption. As a result, electricity is sold at 20 to 30 different prices, optimally managing supply and demand for energy. Experts recommend working on improving the energy sector only if the work can yield significant economic or environmental effects. The negative example is construction of boilers switching from CHP, which was implemented in many Russian regions. It was cheap for the initial investment, but four times less efficient than other analogues during the operation. In recent years, a number of documents was issued at the federal level that regulate activities in the field of energy saving. However, while political decisions are contrary to the electricity tariff regulation, and political regulation is cut off from technological nature of production, transportation and distribution of electricity and heat, goals to increase energy efficiency set by the government and society will not be achieved.